This is a simple 21st birthday cake. There was no specific request from the birthday boy, so I just made a simple design. The first cake is a marble cake and the latter is a chocolate cake. Clifford were made using piping gel. I traced clifford's picture on the cake and outlined it with black-colored buttercream icing. And then I filled in red-colored piping gel. This is a butter cake covered with buttercream icing. I made two heart-shaped butter cake and combined both by cutting one of the cakes.The flowers were made of fondant (this was my first experiment with fondant). I used the cookie cutters to make the flowers. And I added the heart-shaped sprinkles at the sides. This is a vegetarian chocolate cake. I did this cake for independence day in 2007. The flag is made of piping gel. 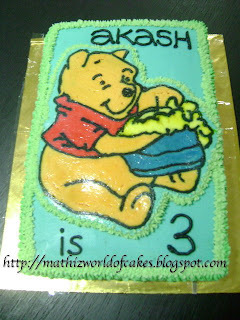 Tips: always make sure that the background icing colour is white or cream, so that it can enhance the piping gel's color. This is a marble cake with a simple design. I did this cake for a new year get together. This is a butter cake covered with buttercream icing. I made this cake for my cute little niece when she turned 1. It was a chocolate cake covered with buttercream icing. I did the baby minnie using piping gel. This is my first attempt using piping gel. I outlined the minnie using black colored buttercream icing and filled the rest with piping gel. I made this cake for my husband on his birthday. It was a marble cake. I then decorated it with buttercream icing. Another cake I really admire. The color combination turned very well. Sweet colors. This is a simple butter cake I did for a birthday celebration for 2 sisters with same birth date. I made the two girls on the cake using buttercream icing. I really love working with buttercream icing. You can really decorate the cakes in so many styles or patterns using buttercream icings. This is my first doll cake. It was one of my "try-out" project. No idea of what dress design to put in, so I just used my imagination( can become a fashion-designer :)). It turned out well I guess. This is a sweet 16 cake for a girl (obviously). There was no specific request for patterns. So I just randomly added flowers with different colours, to make the cake "sweet". It is a chocolate cake. I did this cake for my dad's 60th birthday. It is a book-shaped chocolate cake covered with buttercream icing. I added the 2 clowns just to make the cake look "fun". It was a hit among the kids, though! The clowns' body are made from buttercream as well.